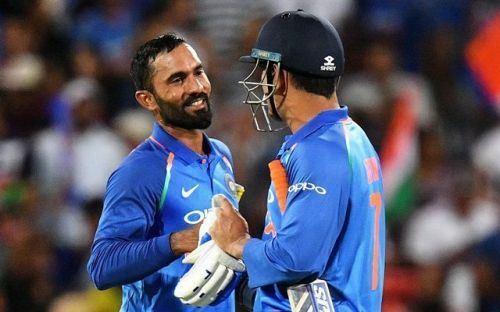 Dinesh Karthik has opened up about his World Cup 2019 selection, giving his thoughts on being picked as a back-up wicketkeeper in the Indian squad. He was uncharacteristically self-deprecating in his reaction, suggesting that would only be playing a secondary role in the mega event. The BCCI selection committee announced the team for the World Cup on Monday. While everyone thought Rishabh Pant would be picked as the back-up wicketkeeper, the selectors sprung a surprise by picking Karthik ahead of him. They also stated that Karthik had been picked due to his accomplished keeping skills and his finishing abilities in crunch situations. The Tamil Nadu wicket-keeper has now opened up about his selection, expressing his understanding that Dhoni would play all the games if not injured. "In this World Cup when it comes to MS Dhoni, I am like that small first-aid kit that goes along with him; you know that ‘Band-Aid’ for that small injury,” Karthik said. Karthik also said he can bat at number four if the opportunity was given to him, or adopt the finisher role too, depending upon what the team management wanted. "But I also know that I could have an opportunity to bat at No. 4 and be the finisher. And post the IPL, I would be preparing every day believing that it could happen. I know I can play that role because I have done that before,” he added. Karthik was picked ahead of Pant, but the experienced player believes that won't affect their relationship. He stated that both could play together for India post the World Cup, just like Karthik and Dhoni played in the same team in the past. "I know I will be sharing the journey, touchwood, with Pant well post the World Cup and I will enjoy that journey. We have already played together and I enjoy spending time with him. I don’t see why like how Dhoni and I played, Pant and I can’t play together. I know we will be playing together, touchwood," he said. Karthik is currently leading the Kolkata Knight Riders in the IPL. He would love to end the tournament by winning the trophy before heading towards England for the World Cup.